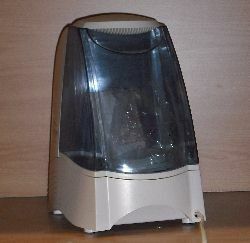 There are many kinds of portable humidifiers on the market. Basically there are three types: ultrasonic, warm mist and cool mist. The ultrasonic or 'cold spray' humidifier can create an odd problem. In areas with hard water, the hardness minerals (mainly calcium carbonate) are left hanging in the air in the form of a very fine white powder that settles on everything. If the water is hard, it is recommended that distilled water be usedinstead of tap water. Room humidifiers must be well maintained to prevent health problems. According to Health Canada, cool-mist humidifiers could pose a health risk if water is left in the tank when not in use. Bacteria can accumulate and multiply in the stagnant water. Persons suffering form asthma, serious allergies and other respiratory problems risk having their condition aggravated. surface of the filter will significantly reduce the efficiency of the humidifier. Finally, do not refill the tank until you are ready to use it.